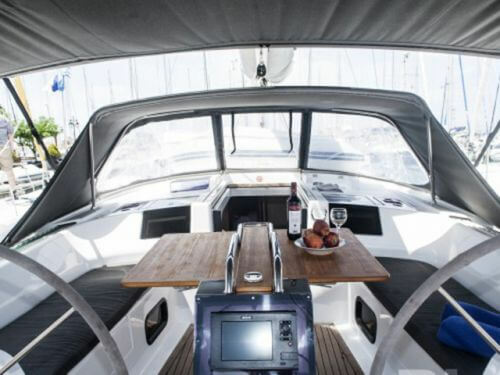 Looking to sail from Lavrio? 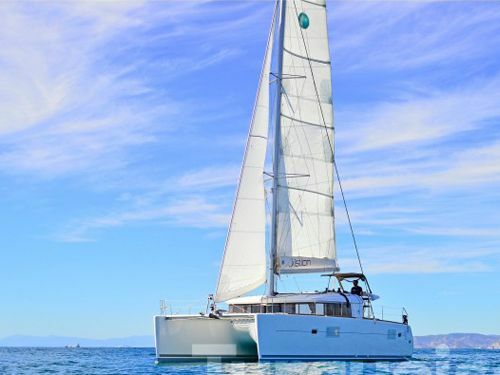 Search to find and book your ideal boat, or read everything you need to know: prevailing winds, where to sail, what to see, where to eat or sleep, how to get here and more! From Lavrio, it's possible to sail to explore the Saronic islands to the West or, more traditionally, the Cyclades islands to the South. 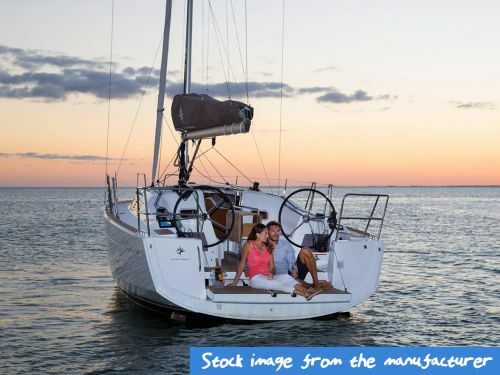 Both sets of islands offer spectacular places to sail, with natural beauty complemented by intensely cute fishing villages, impeccable local hospitality and a relaxed pace of life - not to mention the remarkable sunshine and reliable winds. You could sail to the stunning 'Kithnos sandbar' beach (which is a wonder to behold and can only be reached if you have your own boat), take a pilgrimage to visit the national Cathedral on Tinos, or see ruins of ancient Greece on Delos. You can also visit Mykonos and see if you agree that it is the best island in the Mediterrean. 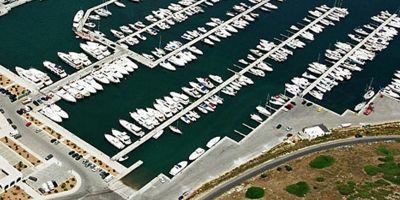 Lavrio is under an hour away from Athens airport, and has great facilities - it was the home of the sailing events for the Athens 2004 Olympics. Lavrio is superbly located for explorers – easy to arrive at, but with boundless possibilities and directions to travel. Heading South into the Cyclades, you’ll find the hot thermal springs of Kithnos, the beautiful Mykonos, and the magnificent cathedral at Tinos – not to mention the mesmerising old villages of Paros, Naxos and Santorini if you have the time, inclination and energy to make the distance. If that wasn’t enough, you could head West to explore the wonders of the Saronic islands – the stepped marina of Hydra, and the charming towns of Poros and Aegina. Or head East to cling to the mainland coastline and make your way to the Skaithos or Skopelos in the Sporades. So much to choose from, so little time! The ancient temple of Poseidon has stood on a hill at the Cape of Sounio for close to two millennia. It’s still remarkably in-tact and almost as exciting to view from the sea. Just imagine who else has sailed past it in all that time? Quite simply one of the most magnificent buildings in the whole of Greece, perched on an island in the middle of the Cyclades. Be amazed as you watch pilgrims crawl on their hands and knees from the marina to the cathedral to say their prayers. The third most famous place in Greece (after Athens and Corfu) – it’s a cute island with an old town comprising cobbled streets, whitewashed cottages, windmills, tavernas and piazzas - and amazing sunsets. There’s so much to explore from Lavrio, and the Cyclades are so vast, that unfortunately it isn’t possible to see it all in one week on a boat – at least, it is if you want to actually get off the boat to enjoy each of the places you pass! So we’ve developed this itinerary to give you plenty of sailing, a new port every night, hitting all the highlights, but also with enough time to relax, pop into nearby bays for a swim at will, have a leisurely breakfast or lunch, and enough time to get a feel for the places we visit. Regretfully, that means leaving Santorini – the most beautiful island in Greece – on the cutting room floor, as it is too far to get to and from inside a week without it feeling like a chore. Similarly, Paros and Naxos, and Folegandros – all delightful places to visit - also fall by the wayside. We’ve designed this itinerary on the assumption that after checking-in and sorting out your provisions on the Saturday, there won’t be enough time to do a meaningful sail – which means this is a 6-day itinerary that also finishes in Lavrio next Friday night, when you’ll have the boat inspected prior to checking out early on Saturday morning. In total this itinerary is 157 nautical miles, with the longest day being 33 nM on the final day – at a pace of 5-6 knots, that means you should be able to complete most of the sailing at a reasonably leisurely pace. After briefing your crew, stowing everything below deck and pulling on a few of the ropes to remind yourself which ones are the important ones (they all are! ), you’re all set to sail. Drop the lines, and coast gently out of the marina looking cool. Once out of the marina, point your nose South-west, going with the prevailing wind to fill up your sails. Keeping in this direction, in five nautical miles, the Temple of Poseidon will be on a hill on the starboard side of the ship, and is well worth trying to spot from the sea. It’s been standing since before boats were invented! After glimpsing that monument, change your course to South-East, and the island infront of you is our destination for the night. Loutra port is around the Eastern side of the island of Kithnos, so head East then South to follow the coastline home. Kithnos is famous for its thermal springs and healing waters – you can try them either at one of the thermal spas or in a free bathing area at the far end of Loutra beach. The water is toasty warm! From Loutra, we’re heading to Ermoupoli on the isle of Siros, which is the capital city of the Cyclades region and has a range of grand architecture to match. You can tell straight away that this was originally part of the Venetian empire, with its neoclassically designed buildings, an opera house modelled on La Scala in Milan, and grand piazzas – and there is even a section of the town dubbed ‘Little Venice’ for the way the buildings are built into and around the sea. To get there is fairly straight-forwards – Siros is pretty much due East of Kithnos, which means you should be able to reach across the prevailing Northerly winds to arrive without having to tack too much. Ermoupoli is on the Eastern side of the island, and is certainly a place to go and explore. It has a decent range of fine restaurants, and is a cosy and hospitable place to stay. Sticking on an Easterly bearing, Mykonos – one of the wonders of modern day Greece – is just a short hop away. The arrival into Mykonos is truly memorable, and you can only imagine what it must’ve been like to arrive here if you’d been forced to row here all the way from Athens?! After Athens and Corfu, Mykonos is the most well-known part of Greece, so it will be something of a triumph to be able to tell your friends that you sailed here yourself in your own private yacht (or catamaran). It’s most famous for its beaches and the old town, but it’s also got a lively nightlife and there are lots of people who are there to have fun. Thankfully things have calmed down a little since place was dubbed the ‘Ibiza of Greece’, but there are still a couple of bars that stay open well into the night. Despite being extremely popular with tourists, Mykonos doesn’t ever feel too crowded, and the narrow streets are a joy to stroll around at morning, noon or night. If you haven’t had much time to see Mykonos, there is still time to do it this morning – the planned voyage to the nearby island of Tinos is only short (you can see it in front of you as you look directly out of Mykonos marina) at 14 nM, and it’s shorter still if you go directly to Tinos instead of seeing what Delos has to offer – though we would recommend it. Mythical Delos is a bit like stepping into a history book, and the island, in its entirety, is now a UNESCO world heritage site. It was classed as a sacred land after being the birthplace of the Greek gods Apollo and Artemis. The rules of the day meant that mere mortals were not even allowed to approach it. Later, whilst building the ancient temples that are still there today, there were rules about no mortal being born or dying there – so pregnant women and the aged were banished to Reinia island, nearby. Delos is one of the birthplaces of Greek civilization, with temples dating back to over 600 BC, and a walk around the monuments genuinely feels like a step back in time. It’s not quite as glorious as in the past, but there’s so much still standing that it only takes a little imagination to wonder how magnificent and important a place Delos once was. If you only have time to see one landmark, the Temple of the Lions is the best. From Delos, you’ll head into the prevailing winds, tacking and beating your way up to Tinos, a place with buildings that are just as impressive as in Delos, but in a completely different way. The cathedral at Tinos is a truly magnificent building, which was built using cash donated from right across Greece. It is the Greek equivalent of Lourdes or Fatima, and is at the site where the Holy Virgin Mary appeared to a Nun, telling her where she could find an icon with remarkable healing capabilities. The building is superb to look at, and so many pilgrims crawl from the port or marina up to the church that they lay down a carpet along the route during prime pilgrimage season. August 15th is the biggest and busiest day of the year for Tinos, so if you’re here then, prepare for a wonderful celebration! Andros is a relatively undeveloped island - as you should notice as you sail alongside her – and Gavrio is a quiet and picturesque fishing village, which is pretty much your picture postcard Greek island sailing marina. It’s a very relaxing place to spend the night, there are some nice beaches nearby, and the people here will look after you well. The final leg of our itinerary, from Gavrio back to Lavrio, is also the longest, but at 33 nM it should not feel too long. We’re heading due West with a reach or a broad reach against the prevailing northerly winds, which should mean the crossing is not too complicated. Once you’re back in Lavrio, the boat will need to be returned where you got it from, and you’ll need to pay for it to be refuelled (this is usually via a mobile mini-tanker which will come to you, rather than via a fuelling berth, but check with your charter company, as some do it differently). 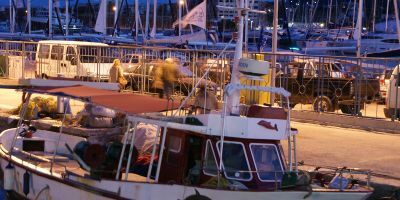 Lavrio has a few bars and decent restaurants to help you to ease yourself back into a life on-land, and there will be plenty of other sailors out and about in town as the boats come in and the crews change over for another week. Hopefully, you will’ve had an exhilarating yet blissful week, and enjoyed seeing so many different aspects of the islands. 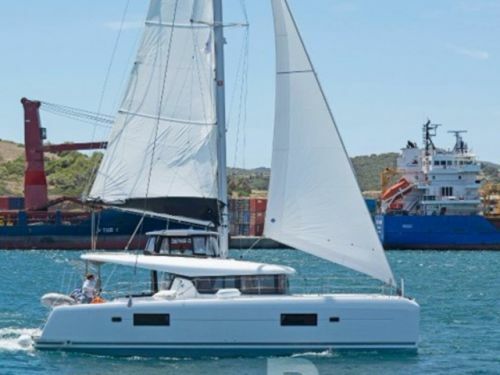 There’s still so many islands in Greece left to explore, so when you’re ready, in a few weeks’ time, you should check out PlainSailing.com and find out where to charter next year! Lavrio is blessed with fine weather pretty much all year round, and the temperatures seldom drop below ten degrees, even at the height of winter – which means that you should almost be able to sail in shorts and t-shirt all year round! 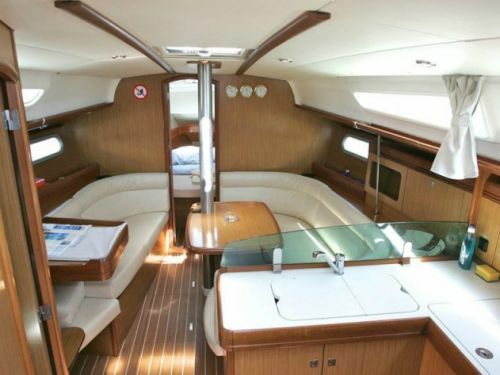 Of course, the temperatures rise as the sailing seasons hots up, with very pleasant weather (and practically no rainy days) from around May, when the mercury reaches 20 degrees or above. 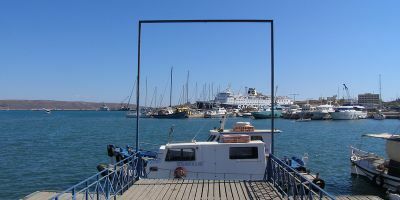 The average temperatures bely the fact that sometimes the weather in Lavrio can be stifling, with temperatures in the high thirties or even about forty degrees Celsius not uncommon. If you can bear to be outside in such temperatures, it’s good to be at sea, when the wind can help to make you feel cooler. 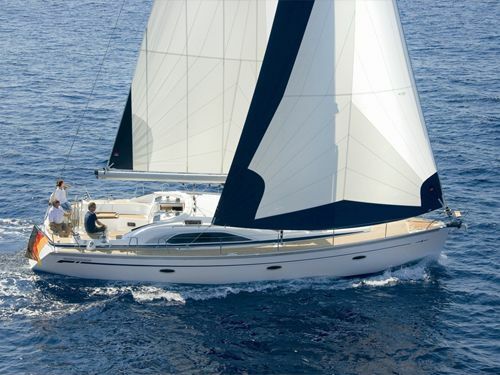 You can sail in Greece in comfortable weather right until October, but the rainy season (or at least, when there is even an opportunity of rain) starts to kick off in November through to January/February. For most of the year, the sea is warmer than the air temperature, so you should have no problem in diving in, particularly as the sea never falls below 15 degrees. At its peak, the sea hits about 27 degrees which will feel more like you’re in a swimming pool than in the sea (which is a good thing), so make sure you pack your swimming trunks! 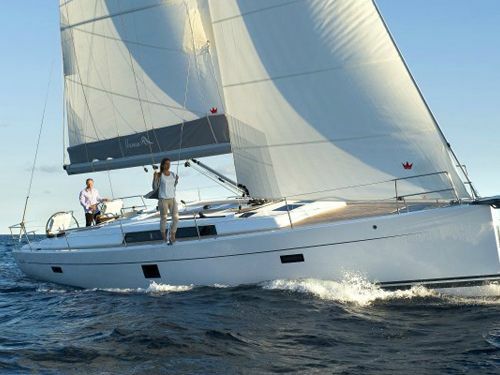 The one thing you can say about sailing in Greece as a whole is that there is no such thing as a prevailing wind – the wind whistles round the islands in almost every direction possible. There are, however, local pockets of prevailing winds. For Lavrio, if you’re heading down to the Cyclades, that means Northerly winds will be behind you as you head out to Paros or Sifnos, for example. If you head off towards the Saronic islands, it’s another thing entirely, and you’ll most likely be sailing in prevailing winds from which arrive from the South. During the sailing season, winds are traditionally between Force 3 and Force 6 – which are optimal for cruising sailors - though there are occasions where the winds spikes up to Force 7 or 8 for a couple of days – these are Meltemi winds which descend from the Hungarian mountains and race across to Turkey, and are most likely to occur in July or August, helping to take the sting out of the stifling temperatures, and giving sailing enthusiasts the slightly challenging conditions they relish – though be prepared to throw in a few reefs. In winter, the winds are less predictable, even at a local level, and weather systems can arrive from the mountains to the north or spin out from tropical regions near the Equator, bringing stormy weather, if only for a couple of days. What is the Current Weather in Lavrio? The site of a silver mine, Lavrio has grown from its inception in 800 BC to a seaside port and tourist resort today, with a two large and modern yacht marinas, notable archaeology and mineral museums, many cafes, bars and tavernas, fine views, and good beaches. 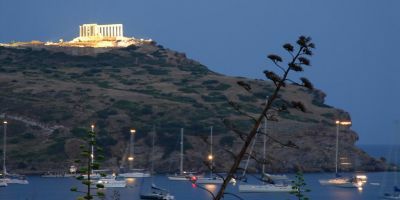 The town is located just 10km from the cape of Sounio, where there are the ancient ruins of the Temple of Poseidon, along with a number of other ancient monuments. The Cape also used to be an important land-mark for sailors departing from Athens back in the day. Lavrio offers a versatile range of beaches - from sandy to pebbly, to some with interesting coves for snorkelling. The water is always clear, the beaches don't have the same bustle as those in the larger Greek resorts, and every so often some crystals will be washed up on the beach (the whole area used to be predominantly a mineral mine, but they are now all closed). The town has grown massively in recent years, and there is now a decent range of quality bars and restaurants to please every type of tourist, including those just passing by on their way to a reasonably important ferry-port. In the town, the museums of Archaeology and Minerology both host some interesting artefacts if you like that sort of thing, but the museums in general could do with a little more care and attention. 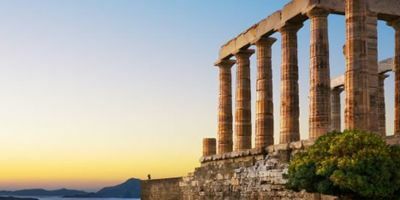 Away from the town, the ancient ruins of the Temple of Poseidon at Sounio are a very short taxi ride - or a decent hike along the coast - away, and are worth a look. They are a remarkable example of ancient Greek architecture, and it’s incredible that they’re still standing after all these years. The cape also offers superlative views out to sea and is a wonderful place to watch a sunset. Being so close to Athens, there’s a disappointing lack of major cultural activities taking place, because everyone heads to bigger stages and venues up the road. That’s not to say that there’s nothing going in Lavrio - there are typical Greek Orthodox Easter parades and celebrations, and the locals like to make a bit of noise when there are international sailing races taking place, or after their local basketball team have won. Pezodromos – the best restaurant in Lavrio by some way, this place will have you licking your lips and returning time and again. Specialities include locally caught seafood, which arrives fresh from the sea the same day as it is cooked (Ermou 40, Lavrio). Arte Italiana – the best ice-cream in the city is served just a few hundred metres from the main marina. As it’s practically always sunny, I think you’re technically allowed two a day (and these ones are worth the calories)?! Delicious! (29 Iroon Politechniou, Lavrio). If you’re after nightclubs, you’re unfortunately in the wrong place – Lavrio doesn’t have a wild nightlife, but that’s not to say that you can’t enjoy yourself in an atmospheric bar in the old town, particularly after a couple of shots of Raki. At the weekends, there are a couple of places to dance at, which are usually full of sailors, all playing an odd mix of Europop and Greek pop along with classic dancefloor fillers. Being something of a Basketball town (the local team play in the Greek top division), there are also plenty of sports bars from which you can follow any sporting action. Loft 49 – situated above street level, this place often has live music on at weekends, followed by heavy beats (49 Iroon Polytechneiou Street, Lavrio). Nikolakakis Rooms Lavrio - c. £60/night for a double room – this is one of the few hotels located in Lavrio. It offers basic accommodation, which would do the job for a night as a place to stay, and the price includes a free breakfast. From here it’s less than 100m to the main marina. 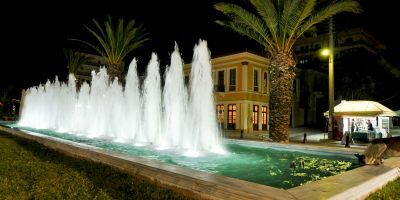 NJ Apartments – c. £130 for a double room – this is the other option located in Lavrio, and is an apartment with a kitchenette. It’s well located for Lavrio marina and the old town, but is an expensive place to stay. Aegeon Beach Hotel **** - c. £120/night for a double room. Just 10km along the coast from Lavrio, Sounio is famous for its ruins and its fine beaches. This 4-star beach resort offers comfort and luxury, and would make a relaxing and stylish place to start or end your holiday. 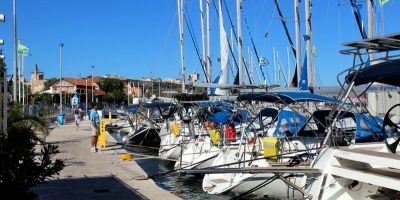 In the heart of the old town, Lavrio marina is famous for international sailing competitions (Lavrio hosted the sailing events for the Athens Olympics in 2004) and offers space for over 200 boats. 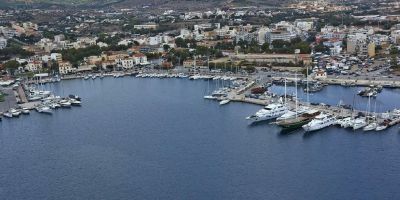 Facilities are maintained to a high standard, and a mini-market, chandlery and restaurant/bar are on-site, whilst the ever-developing town of Lavrio stretches around the marina, offering restaurants, tavernas and bars. Lavrio is an excellent starting point for exploring Greek islands - the nearest one is under an hour sail away. The nearest supermarket of a reasonable size is the My Market on Κουντουριώτου, Λιμένας Λαυρίου, Lavrio 195 00, Greece. It’s only a short walk from the marina, and if you ask, they can arrange to deliver your shopping to the marina. The nearest airport to Lavrio is Athens International airport, which, as the name suggests, receives aeroplanes from all over the world, and is about 40km away. A transfer or taxi from the airport to Lavrio takes about 45 minutes and can be arranged by our team. It’s also possible to make the same journey by bus: buses are quite regular, but you’ll need to get a bus to the bus terminal in the town of Markopoulo, and then change there for a bus to Lavrio. The journey by bus takes around 90 minutes in total.